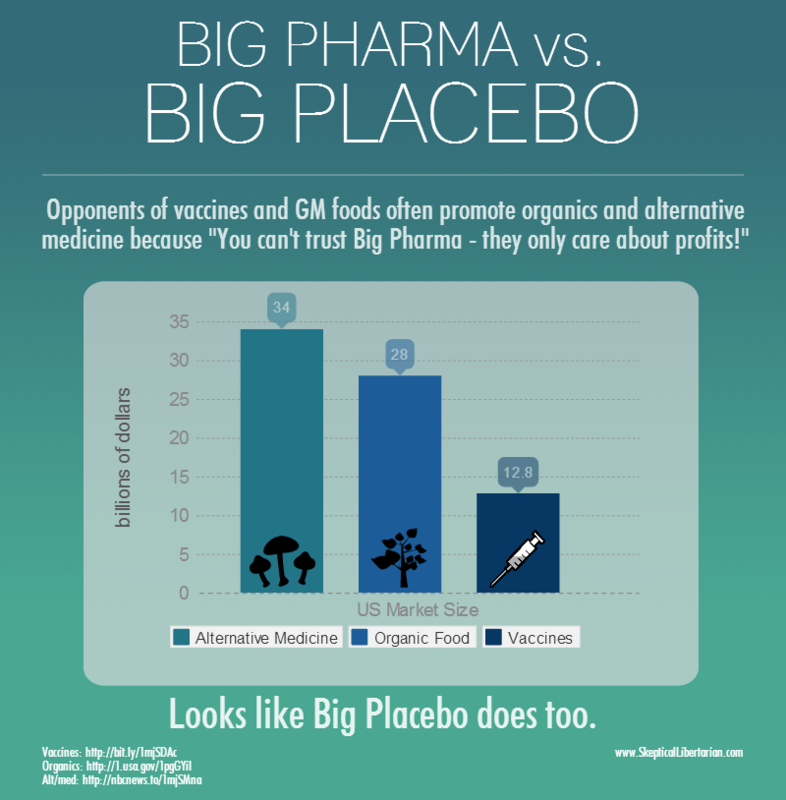 It’s quite common to hear people say that they don’t trust vaccines because “Big Pharma only cares about profits” or other appeals to fear of greed. Never mind that vaccines are just about 3% of US pharmaceutical sales — and so are relatively unimportant to drug companies — let’s see where this logic takes us. If making billions of dollars on a type of product is grounds for suspicion, why only focus on vaccines? Americans spend $28 billion a year on organic food and $34 billion a year on “alternative medicine”; by contrast, the vaccine market is less than $13 billion. My point is not to attack profit — no business would exist without it — but to simply show how absurd the argument is that because drug companies are driven by the profit motive (“greed”), therefore you can’t believe anything they say about their products (e.g., vaccines). Money and profits don’t become magically better or worse when corporations are selling unproven snake oil instead of tested medicine. You must look at scientific evidence to judge claims about products, not the price tag or the bottom line of the companies who make it. 2012 Whole Foods net sales: $11.7 billion. 2012 Monsanto net sales: $13.5 billion. Hmm. Well. Seems like making money can’t be such a bad thing after all. Again, the point is about profit and its implication on the motives, trustworthiness, and reliability of an industry. If the $12.8 billion from vaccines (3% of all drug sales!) is enough to corrupt and discredit the entire government, pharmaceutical industry, and scientific establishment, what exactly does $62 billion a year in organics and alt/med sales do to their credibility? The answer is nothing. Evidence, not vague fear-mongering about “greed”, is the only thing that can settle scientific questions.